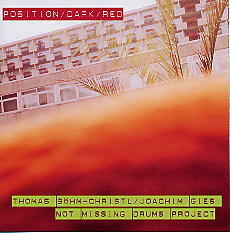 This is the third CD by NOT MISSING DRUMS PROJECT led by the saxophonist, Joachim Gies, and cellist, Thomas Bohm-Christl. The music is taken from live recordings of two concerts with eleven musicians taking part. The wealth of natural colour within the ensemble - vocals, strings, wind instruments - is complemented by the artifical shades of synth and sampling. The classically trained voice of Ute Doring generates both a post-modern romanticism and a sensual nocturnal luminosity. Utterly original as are all the previous CDs by this group.